Originally published on December 15, 2008. 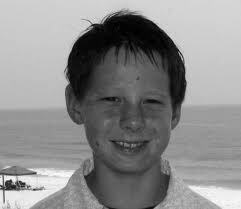 Caleb Spady died on July 21, 2009, having fought brain cancer (DIPG) for 15 months. “One quick question,” I said to my pastor. He was heading back to his lunch table with a full cup of coffee; I’d finished my lunch and wanted a word with him before I had to leave. “A lot. For one thing I just lied to my pastor." I realized in that moment what he no doubt already had guessed. “My question is neither quick nor singular.” Guy Sayles smiled, relaxed and unhurried. I forged ahead. "I’m not sure theological degrees give you the words to say under those circumstances," Guy said, speaking the frustrating truth of pastoral care. I found this to be brilliant instruction. How many times do we spout off theological treatises when it just isn't the time? The person really needs to hear, “What you are going through is awful and I’m sorry that you are going through it because you matter to me.” And we start quoting scripture, telling them about God’s will or the nature of creation. Sometimes, we need to say less in order to say more. God's greatest power was displayed on the cross. God's power is in weakness. We are free when we become God's slaves. We are greatest when we become the least of all. I knew he was right. But what could I tell my friend that could comfort her, if only momentarily? "Don't Know Beans about Praying"
Exactly, Aileen. If our hearts are breaking and God loved us so much that he sacrificed His only begotten Son, Jesus. then His heart must be breaking also, out of pure love. Who can beat that. No one! After all He is our Father and we are His children. Blessings to you Barbara as you adjust to the losses in your own life! There will never be a reason in the world good enough for our children to be in the ground while we are walking around. It's true that I will be better for having had my son in the first place and my life can and eventually should reflect this. It is a fallacy, I think, to assume that any reason will ever be good enough. I do remember Jobs friends offering lots of reasons and answers. All of them were wrong. Oh Jesse! I absolutely agree. The loss is so profound, so consuming. You speak the truth: "there will never be a reason in the world good enough." Any reason offered would be "a clanging gong or a clashing cymbal." Prayers for you as you cope with this most unimaginable loss.